This Acrylic Candy Jar is ideal for banks, hospitals, schools, offices, and much more, and each custom jar makes a fun and unusual give-away. Jar lid colors include: red, blue, clear, and green. Your satisfaction is guaranteed when you order custom glassware from us. CJ12 12oz Candy Jar 2.34 2.25 2.15 2.05 1.95 1.85 3" 3"
It's easy to get started with your custom Candy Jar - simply call 1-800-233-0828, and then e-mail your camera-ready artwork to graphics@kardwell.com (you can also mail or fax your design). 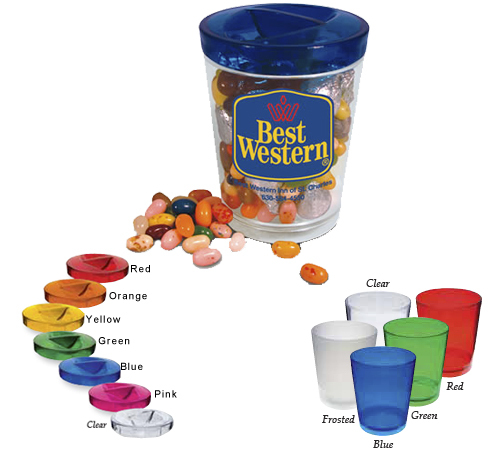 The minimum order is just 50 imprinted Candy Jars. Production/shipping time is 3-4 weeks. Rush delivery is available for an additional charge.